Cover your furniture with light plastic before painting the ceiling. Ceilings are the most difficult areas to paint, but well worth the effort. With a few simple steps ceiling painting can be much easier and produce better results. Many of the same procedures when rolling ceilings are the same as the walls. The general plan for painting ceilings is to prepare the room, repair any damage, cut in the edges with a brush and then apply the paint to the large areas. The best plan is to finish the entire ceiling painting in one session. Allowing the paint to dry at different times will produce visible lap marks. Before starting the ceiling painting remove as much furniture as possible, any remaining pieces need to be moved to the center of the room. 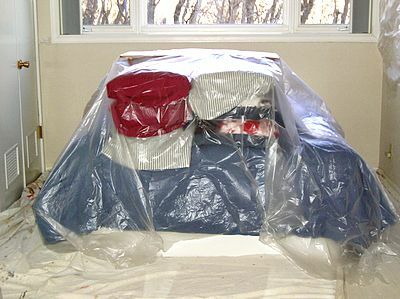 Cover the entire floor with good drop cloths and the furniture with lightweight plastic. Plastic on the floor will not work. It won’t stay put and will stick to your feet. Place masking paper over the tops of the window and door frame. Also cover any windowsills. These areas can be completely covered with plastic masking film for extra protection. Use a hand held masking machine for the paper and plastic. Any remaining items will need to be covered with light weight plastic. Hanging pictures and unmoved furniture are good examples. Completely covering the walls is not necessary if a quality roller cover and quality paint is used. Remove the light fixtures if you are confident in doing so. If not, loosen the fixture so you can easily brush around it, dropping it a small distance from the ceiling. This will speed up the time to cut around the fixture with a brush. Drape plastic or masking paper over the light fixture to protect it from any splatters. A ceiling fan can be masked with either masking paper on the blades or draped with plastic and taped secure. Most fans have a removable cover over the motor. Remove this cover if possible. Repair drywall cracks and any damage before proceeding with the ceiling painting. 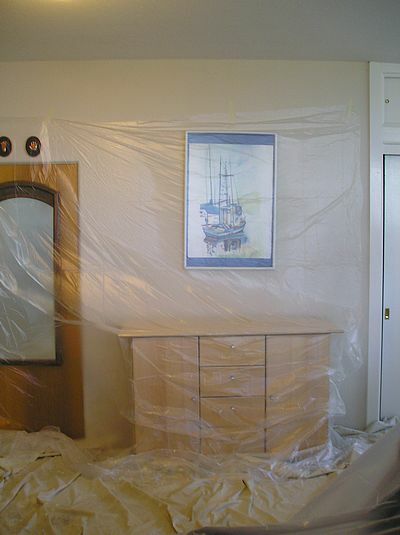 Stains from water damage need to be sealed with a stain blocking primer. Apply 2 coats to be sure the stain is fully sealed. Use an appropriate interior primer for your particular situation. The best tools are the same as for painting walls. Use a 9-inch paint roller frame and a lambs wool roller cover. The thickness of the cover depends on the amount or lack of texture on the ceiling, 1/2 inch for smooth and 3/4 inch for textured ceilings. A roller pole is necessary and will save you a lot of time and effort. Choose a roller pole that is comfortable to use and extends far enough to reach over any obstacles. To complete a professional roller set-up use a 5-gallon bucket and roller screen instead of a pan. A good paintbrush is needed to cut-in the edges and around any light fixtures. A 2-1/2—3 inch brush will work well. Use a size and style you are comfortable using. Good tools are as important as quality paint. The type of paint and sheen will affect the overall appearance of the ceiling. For most ceiling painting jobs I recommend a high quality flat paint. Flat paint will dry evenly and is less likely to show roller lap marks. Plus flat paints can hide some imperfections. Areas with high humidity will need a paint with at least a little sheen. Satin sheen acrylic paint is a good choice for most bathrooms. Semi-gloss can be used if more water resistance is needed, such as ceilings in shower stalls. Typically top quality acrylic paints are thick and will need to be conditioned before use. Add a paint conditioner, such as Flotrol, instead of water. Water will make acrylic or latex paints splatter and drip more. For oil base paints use Penitrol instead of mineral spirits. Most oil base products won’t need any conditioning for rolling. For most ceilings I like to use a brush and roller. Of course a ceiling can be sprayed using an airless sprayer. I recommend this method for painting acoustic ceilings. 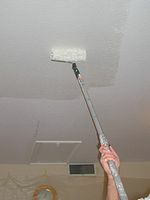 Choosing to spray a ceiling will require a lot more masking and covering. Painting ceilings with a brush and roller is a very “user friendly” method, needing the least experience and investment in tools. The steps needed are brushing next to the walls then rolling the paint using an efficient pattern. Brushing should occur first, if one coat of paint will be applied. For two coat applications quickly roll the ceiling then cut-in twice while waiting for the ceiling to dry. 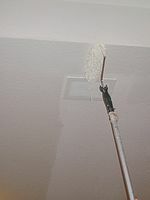 Start by cutting in the edge of the ceiling at the walls with your brush. Bring a strip of paint out on the ceiling 3-4 inches wide. If the light fixture is accessible cut it in as well. If not, brush around it at the end of the ceiling painting. Careful and slow brushwork is needed in order to have a straight line. Take your time. Tape doesn’t work very well, but can act as a guide making this task a little easier. Try to apply the smallest amount of paint possible next to the tape, dry brushing, to reduce the amount of seepage under the tape. Roll in a straight-line pattern. The use of a “W” or “V” pattern will spread the paint too thin and is more work than necessary. A straight pattern applied opposite of your main viewing angle will help hide any roller marks. By applying the paint in sections and working back and forth towards the door a wet edge can be maintained. Begin rolling the ceiling parallel from the wall opposite of the entry door. An average stroke of the loaded roller will be 4-6 feet. This is about a third of the width of most rooms. Paint a section, 4×4 or 6×6 area, and then move over and repeat. Blend each section while rolling by continuing each stroke into the previous section, overlapping 6 inches will be enough. Keep repeating this back and forth pattern until finished. Rolling this way works great for smooth ceilings and paints that have a sheen, such as satin and semi-gloss. Ceilings without any texture are the most difficult to paint. 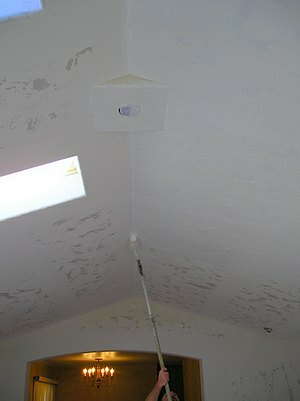 Textured ceilings, orange peel and knockdown, are much easier. Don’t press to hard on the roller. This will produce unnecessary splatters and drips. Plus, leave lines of thick paint coming off the ends of the roller cover. Experiment on the first couple of strokes. Be careful when rolling close to the walls. To help this situation roll a band of paint next to the wall, do this as you roll a section. This will extend the brushed areas another 9 inches. Painting a vaulted ceiling with a roller is exactly like painting a wall. Cut-in all edges including the peak. Brush the paint 4-6 inches out from the corners and pay special attention to areas that can’t be reached by the roller. Begin applying the paint near a corner. Spread the paint in a straight-line pattern, overlapping each stroke into the previous one. Paint 1/2 of the ceiling at a time. Reduce the chance of hitting a wall by rolling slowly as you near the wall. I am so glad I found this article! My husband and I are about to paint our living room. I didn’t even think about painting the ceiling first. It could definitely use a new layer of paint, and that should be done before the walls are done. Hi, great tips, I wish I’d have read this before starting the hallway and stairs in my house! I’ve got a couple of questions, if that’s ok? Firstly, we have a big mirror in the hallway and I’d previously touched up the old magnolia paint with a roller under the mirror to get rid of little grubby finger marks! Unfortunately you could always see the roller marks and after painting over with a new colour, these ‘old’ roller marks still show through in natural light. Do I just need another coat (I’m using a one coat paint, Jurassic stone colour!!!) or do I need to sand the wall?? My other question is regarding cutting in. What’s the answer to a wobbly uneven join between the wall and ceiling? Is there a tool that helps to create this crisp edge or do I need to be careful with the sandpaper or do I just need to follow the curves and blips with the brush??? Apologies for the lengthy questions, trying to google answer isn’t as easy as it sounds! Sanding would be the best option to eradicate the roller marks – at least at this stage in events. Another coat should then suffice. Next time I would advise priming first, or, using a paint with a primer. Sometimes we have to do a little bit of extra prep. to obtain the best result, however the time spent is well worth the effort. Walls done, can I paint the ceiling after walls are done? I want to change the ceiling color? Yes you can paint just the ceiling. Be careful of paint splatter on the walls, make sure to have some wall touch-up paint available.